One of the things that I love the most about house call work, and hospice in particular, is the sense of community that it creates. Veterinarians have always played an important role in sustaining and supporting the human-animal bond, but caring for an aging or ailing pet often calls for, and creates, a strong bond between both the caregivers and their nearest and dearest – and going into their homes and helping through that transition lets me bear witness to bonds of family, friendship, and love that I am honored to witness and, on some level, share in. 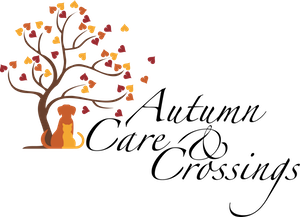 Autumn Care & Crossings is dedicating this summer to community support and outreach. The more people are aware of animal hospice, and the important role that senior pets play in our lives, the better the lives of both pets and caregivers will be. We’re starting, as a culture, to recognize the emotional impact of caring for our pets, and this is amazing – it means that more and more, people will be able to find the support and compassion they need to help them through this emotionally challenging time. And the more people are aware of options for improving their pet’s quality of life, the more we will be able to act to keep our pets comfortable and happy through the last chapter of their life. community to spread the word about animal hospice and palliative care. Boston Voyager has been gracious enough to reach out and write a piece about AC&C, and animal hospice. I’ve also written an article for A-DOG, the Arlington Dog Owners’ Group, to follow on the talk I gave in the fall about caring for aging pets. And lastly, AC&C is a sponsor for the 2017 Somerville Dog Festival. We’ll have a booth at the festival, sharing information about senior pet care, animal hospice, and quality of life, as well as offering supplies for making memorial gardens – please come out and join us! If you know of an organization or resource in your community that would like to learn more about animal hospice, or a place to spread the word, please let me know! The more people are aware of this option, and the more caregivers learn that they’re not alone in this phase of life, the better we can make life for people and pets out there.